Imagine yourself as a young sultan in charge of an empire spanning parts of three continents—Asia, Europe, and Africa—your ancestors brought together through conquests. You are 13 years old and are enthroned in the capital city, Istanbul. You are confronted with the legacy of great rulers before you such as Suleiman the Magnificent and Mehmet the Conqueror. And yet, you are neither a renowned warrior nor an able administrator. How do you leave your mark on the fabric of the city that your forebears coveted and conquered? You commission one of the finest mosques in the heart of the imperial city. The Sultan Ahmet Mosque, popularly known as the Blue Mosque, was completed in 1617 just prior to the untimely death of its then 27-year old eponymous patron, Sultan Ahmet I. The mosque dominates Istanbul’s majestic skyline with its elegant composition of ascending domes and six slender soaring minarets. 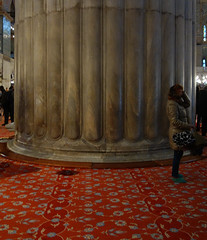 Although considered one of the last classical Ottoman structures, the incorporation of new architectural and decorative elements in the mosque’s building program and its symbolic placement at the imperial center of the city point to a departure from the classical tradition innovated under the famous 16th-century master architect, Mimar Sinan. The mosque’s site is politically charged. 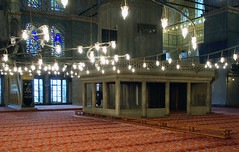 Unlike other Ottoman imperial mosques, which were placed farther away from the city center to encourage urban development and to take advantage of Istanbul’s hilly topography, the Sultan Ahmet mosque is nestled in between the Hagia Sophia and the Byzantine Hippodrome near the Ottoman royal residence, Topkapı Palace. In fact, the choice of location caused some consternation since it required the demolition of quite a few established palaces owned by Ottoman ministers. But prestige outweighed the enormous cost in coin and real estate. Constructing large mosque complexes for the benefit of the public was part of the imperial tradition denoting a pious and benevolent ruler. Placing the mosque adjacent to the Hagia Sophia also signified the triumph of an Islamic monument over a converted Christian church, a matter of great concern even 150 years after the Ottoman conquest of Istanbul in 1453. The rivalry between the two monuments is difficult to ignore as you alight from the tram and walk towards them today. Both buildings overwhelm with their massive proportions and their individual claims on the city’s history. 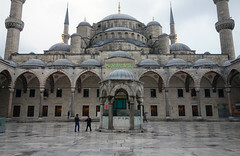 But the Sultan Ahmet mosque is distinct from the 6th-century church. The mosque features two main sections: a large unified prayer hall crowned by the main dome and an equally spacious courtyard. 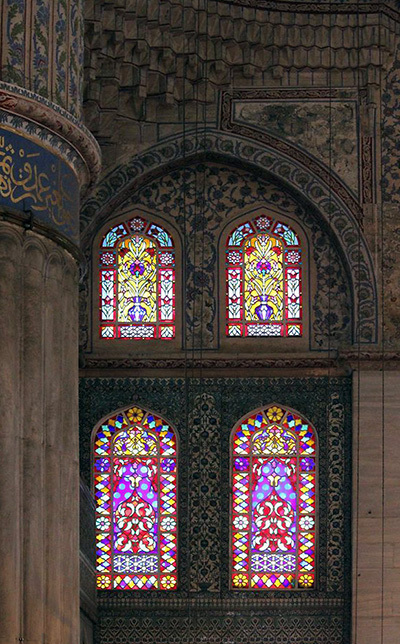 In contrast to earlier imperial mosques in Istanbul, the monotony of the exterior stone walls is relieved through numerous windows and a blind arcade. Huge elevated and recessed entrances penetrate three sides of its precinct to provide access to the sacred core. The courtyard’s inner frame is a domed arcade, which is uniform on all sides except for the prayer hall entrance where the arches expand. Inside, the central dome rests on delicate pendentives (triangular segments of a spherical surface) with its weight supported on four massive fluted columns. In order to extend the prayer space beyond the span of the central dome, a series of half-domes cascade outwards from the center to ultimately join the exterior walls of the mosque. 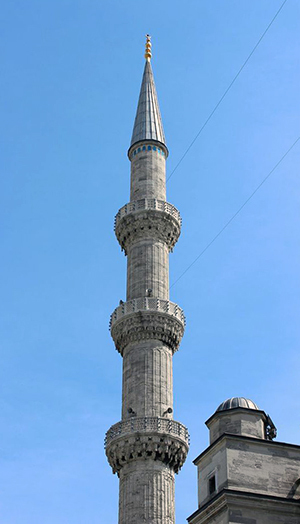 Of the six minarets (towers traditionally built for the call to prayer), four are positioned on the corners of the mosque’s prayer hall while the other two flank the external corners of the courtyard. Each of these “pencil” minarets has a series of balconies adorning its lean form. Six minarets were unusual even for an imperial mosque—they implied equality with the multi-minareted mosques of Mecca leading to considerable resistance from the local population. The solution? Legend has it that in an attempt at appeasement, a seventh minaret was added to the mosque in Mecca, proving its primacy over any imperial mosque in Istanbul or elsewhere. But evidence to support this claim is thin since some believe the seventh minaret already existed prior to the Blue Mosque’s construction while others cite a much later date for the seventh minaret’s addition. The prayer hall itself is punctuated with several architectural features including the sultan’s platform and an arcaded gallery running along the interior walls except on the quibla wall facing Mecca. A carved marble niche set into the center of this wall guides the faithful to the correct direction for prayer. To its right is a tall and thin marble pulpit (mimbar) capped with an ornamental turret. 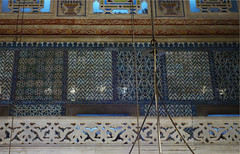 Upper sections of the mosque are painted in geometric bands and organic medallions of bright reds and blues, but much of this is not original. Rather, the careful choreography of more than 20,000 Iznik tiles rise from the mid-sections of the mosque and dazzle the visitor with their brilliant blue, green, and turquoise hues, and lend the mosque its popular sobriquet. Traditional motifs on the tiles such as cypress trees, tulips, roses, and fruits evoke visions of a bountiful paradise. Sultan Ahmet requisitioned these specifically for the building. 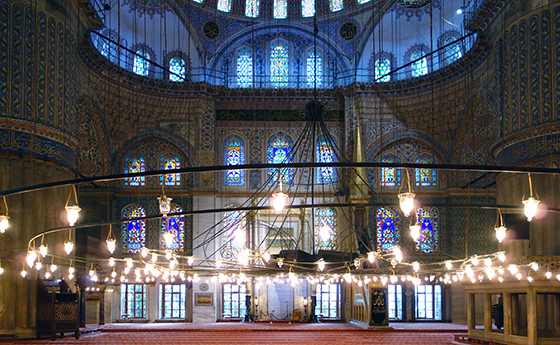 The lavish use of tile decoration on the interior was a first in Imperial Ottoman mosque architecture. The intensity of the tiles is accentuated by the play of natural light from more than 200 windows that pierce the drums of the central dome, each of the half-domes, and the side walls. These windows originally contained Venetian stained glass. The Sultan Ahmet Mosque is particularly remarkable in that it was conceived and built during a time of relative decline. In the past, grand mosques were constructed as markers of prosperity and political strength. Even though Ahmet I showed promise when he first assumed the throne, he is now seen as a weak and incompetent sultan. A few short years into his reign, he conceded autonomy to the Habsburg rulers and freed them from paying tribute. His inability to control and sustain a stable administration inaugurated an era of malaise and contributed to the reversal of Ottoman fortunes. 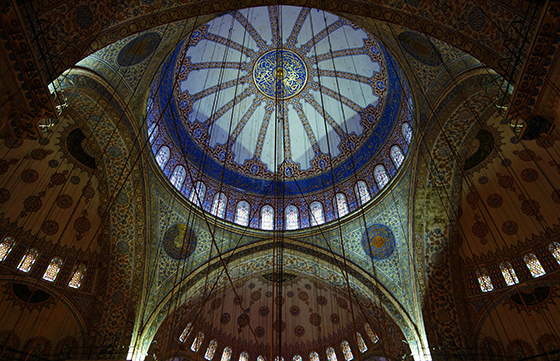 In spite of these troubles, his legacy remains cemented in the breathtaking beauty of the Blue Mosque. Freely, John. Istanbul: The Imperial City. London: Viking, 1996. Goodwin, Godfrey. 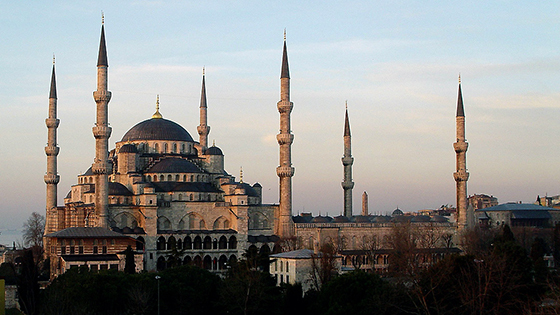 A History of Ottoman Architecture. 1971. Reprint, New York: Thames & Hudson, 1987. Kafescioğlu, Çiğdem. Constantinopolis/Istanbul: Cultural Encounter, Imperial Vision, and the Construction of the Ottoman Capital. University Park: Pennsylvania State University Press, 2009. Mansel, Philip. Constantinople: City of the World’s Desire, 1453-1924. New York: St. Martin’s Press, 1996. Matthews, Henry. Mosques of Istanbul. Istanbul: Scala, 2010. Cite this page as: Dr. Radha Dalal, "The Blue Mosque (Sultan Ahmet Camii)," in Smarthistory, August 8, 2015, accessed April 22, 2019, https://smarthistory.org/the-blue-mosque-sultan-ahmet-camii/.